With Readly you can read Sega Archives and thousands of other magazines on your tablet and smartphone. Get access to all with just one subscription. New releases and back issues – all included. Since its origins in the 1940s, Sega has been one of the most influential players in gaming history. From arcades filled with sit-down cabs, market-dominating consoles, an iconic mascot in Sonic the Hedgehog and everything in-between, Sega has certainly had its ups and downs. 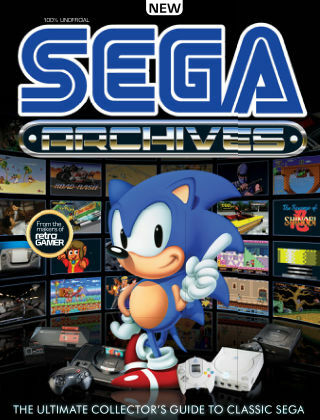 With Sega Archives you can relive Sega’s colourful history, from early coin-op capers to the gamble of the Mega-CD. We’ve scoured the Retro Gamer archives to bring you amazingly in-depth articles on some of Sega’s biggest games and franchises. It’s the perfect way to celebrate Sega’s timeless achievements. Featuring: The history of Sega - Trace the history of Sega from it’s coin-op origins in the 1940s. Inside the hardware - Take a closer look inside the Master System, Mega Drive, Saturn & more. The history of Sonic - Charting the story of the Blue Blur. 20 Sega games you’ve never played - Some of the best Sega games that failed to get the attention they deserved.